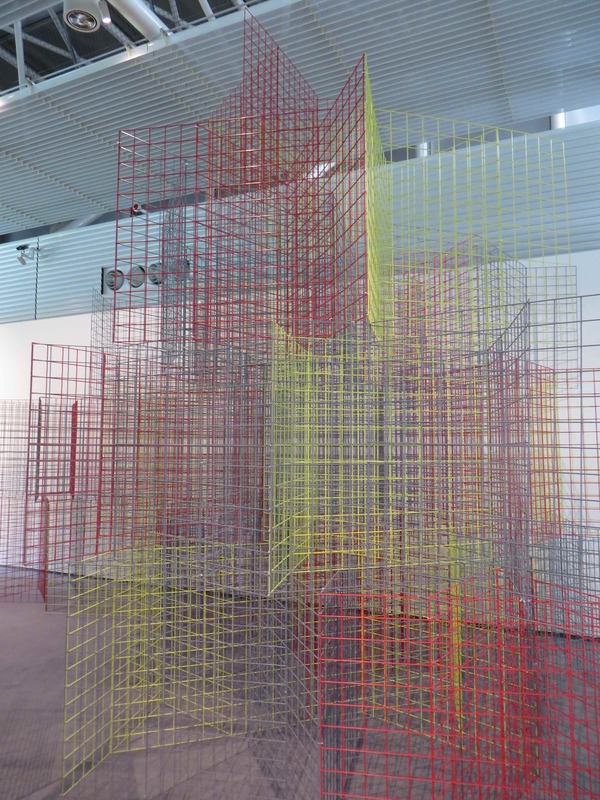 Rana Begum studied at the Chelsea College of Arts and Design (BA Painting 1996–1999) and at the Slade School of Fine Art in London (MA Painting 2000–2002), where she is currently based. Blurring the boundaries between sculpture, painting and architecture, her works engage with space, light and colour. As encapsulated in the title, the exhibition is organised around these key elements, including an additional section focussed on her major projects for public and private commissions. The Sainsbury Centre for Visual Arts offers a unique setting for the artist to explore these themes: the open spaces and clear volumes designed by Norman Foster are complemented by Begum’s orderly compositions, while the vibrant hues of her works stand out against the subdued palette of the building. The space occupied by Begum’s work is not limited exclusively to its physical presence: it also encompasses the gaps between components as well as the surrounding environment. Begum embraces and shapes the empty areas that punctuate the material elements of her work, integrating them as constituent parts in their own right. Her appropriation of the void generates pieces that do not possess a single vantage point. Instead, they require the active participation of the viewer, who is invited to move in front, around or inside the work. Space is also a concept that lies beneath the continuous repetition of geometry and motifs. The modular and rhythmical structure of Begum’s works could be replicated in an endless succession, evoking the idea of an infinite pattern stretching over an infinite plane. As this pattern evolves when viewers incorporate their movement to the spatial perimeter of each piece, it introduces yet another dimension to Begum’s work: time. Time is necessary not only to observe the objects, but also to examine them from various perspectives and realise that their apparently repetitive immutability is gradually altered by changes in light and colour. Light enables vision, which is an idea deeply rooted in the artist’s creative process as the optical illusions generated by the interplay of materials, textures and hues rely on light to be activated. In fact, the apparent weightlessness of Begum’s pieces results from the way each surface reacts to light. Light is also a dynamic element whose elusiveness is used by the artist to her advantage: The rays of light –be it natural or artificial– reflected on an object are in a permanent state of flux, which triggers a continuous renewal of the work as light relentlessly washes over it. In this instance, light becomes the agent that breathes life into a piece. Such fleetingness opens the door to unpredictability. The changing intensity of daylight in the gallery multiplies the ways in which the works can be perceived depending on the conditions of the space. Begum’s colours are drawn from everyday life. Geometry and pattern are highlighted through a deliberate range of chromatic choices that seek harmony and balance. Colour also alters the appearance of prefabricated components, softening their raw industrial overtones and adding an aesthetic quality to their functional aspect, without hiding their original identity. Begum’s approach to colour is at once instinctive and methodical. Her training in painting and her personal taste inform her decisions while allowing space for serendipitous combinations. The selection of the palette that conforms each work and determines its mood lies with the artist, but these solid, unmixed tones give way to unexpected hues and glows that blend through their respective reflection. These are then further nuanced and enriched by the incidence of varying light conditions. Through colour, the artist aspires to instigate powerful reactions in the viewer, creating a soothing and poetic atmosphere. The placidity that Begum strives to convey through her work has been regarded as a source for spiritual contemplation and meditation. Begum has designed and undertaken numerous commissions in the past decade, some of which are illustrated through several models displayed in a cabinet in one of the rooms. Although not all of these projects became a reality, they attest to Begum’s enduring commitment to introduce art into public spaces. They all share a desire to explore the possibilities of merging architecture with painting and sculpture while encouraging the viewer to participate and interact with the work. In this respect, there is a clear correlation and cohesiveness between her studio practice and these large-scale projects. The artist’s fascination with architectural space is related to her interest in past artistic movements such as Constructivism, the Bauhaus, Minimalism and Op Art. These commissions also reflect Begum’s interest in making art inspired by universal feelings that go beyond specific social or political issues. Her projects aim to evoke a sense of surprise and discovery, as well as to prompt viewers to wonder about the production process behind each intervention. They are conceived to dialogue with their environment, nurturing one another in order to create something new. In her pursuit of honesty and authenticity, Rana Begum does not provide definite answers –starting by her reluctance to add descriptive titles for her works. Instead, she continuously challenges her own practice to raise further questions.